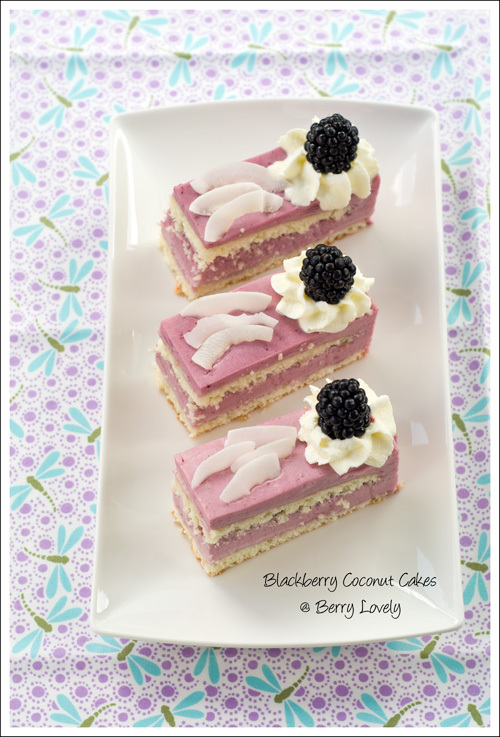 Lately I came across a number of recipes that call for a combination of blackberry and coconut. This pairing sounded a little odd at first, but as unfamiliar as it was, it had a hint of intrigue in flavor and texture. I first tried a blackberry coconut tart, then some blackberry coconut popsicles. After my initial success I decided to try something a little more challenging. The recipe came again from one of my favorite German patissiers Bernd Siefert. 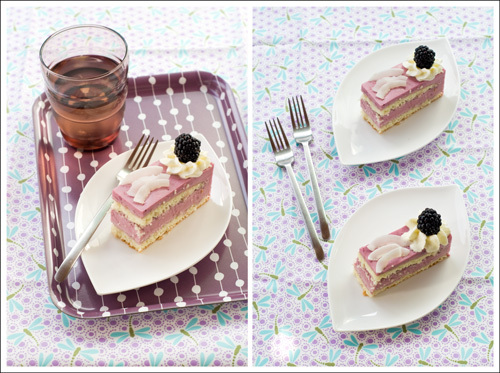 I really love his cakes, and have baked several of his recipes over time, some of them I already blogged about, like the Strawberry-Raspberry Charlotte, the Chocolate Berry Tart and the Strawberry-Champagne Cake. One day I really have to take a trip up to his cafe. 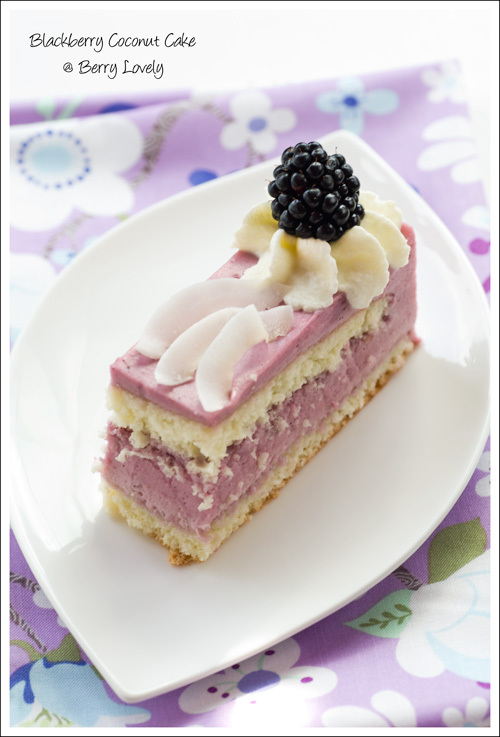 This cake consists of two layers of coconut sponge, filled with blackberry-coconut mousse. The sponge cake itself is not very thick, so it's a little difficult to cut it into two slices. Alternatively you could bake them separately, each with half the batter. The mousse really gets its flavor boost from the lemongrass. The longer you steep the lemongrass in the coconut milk, the more intense it gets. Preheat the oven to 180° C (350° F). Line a baking sheet with parchment paper and put a square (24 x 24 cm / 9.5 x 9.5-inch) baking ring on top. Alternatively use a square baking form, lined with parchment paper. Whisk the egg yolks with half of the sugar until foamy. Whisk in the shredded coconut. Beat the egg whites with the salt until soft peaks form, add the remaining sugar and continue whisking until stiff peaks have formed. Mix the flour with the corn starch and sieve on top of the egg yolk mixture. Carefully fold in together with the beaten egg whites. Fill the batter into the prepared form and bake for about 15-20 minutes until golden. Let cool on a wire rack. In a food processor puree the blackberries with the powdered sugar. Then put everything through a fine mesh sieve. To prepare the lemongrass trim the base of the stalks and remove the tough outer layers. Press the stem with the flat side of a knife to bruise and release the flavor. Cut in about 5 cm (2-inch) long pieces. Slice the vanilla bean lengthwise and scrape out the seeds. In a saucepan over medium high heat bring the coconut milk together with the lemon grass and vanilla pod and seeds to a boil. Turn off the heat and let steep for about 5 minutes. In the meantime soak the gelatin in cold water. Add the sugar to the coconut milk, then add the soaked gelatin and stir until dissolved. Put through a sieve and discard the vanilla pod and lemongrass stalks. Stir in the blackberry puree and put in the fridge to cool. As soon as the mixture starts to set whip the heavy cream and carefully fold in. Continue immediately with assembling the cake. Slice the sponge cake lengthwise into two levels. Put the bottom layer onto your cake platter and put a square cake ring around it. Fill half of the blackberry mousse on top. Add the other sponge layer and top with the remaining blackberry mousse. Put in the fridge to set for at least 4 hours. Cut the cake in slices and decorate each piece with some whipped cream, blackberries and coconut flakes. Berry Charlotte for my 3rd Blog Anniversary!